The Twin in Berlin: Doctrine and Covenants 18:10 Is Like My Life. Doctrine and Covenants 18:10 Is Like My Life. Oh hey. Happy New week and new transfer!!!! I AM STAYING WITH A COMPANION. Let the good times rollllll. This pleases me. SO GUES WHAT RUTH BACK IN BRAUNSCHWEIG IS ON DATE FOR THE 31ST OF THIS MONTH!!!!!! I AM SO HAPPPY. wow. What a life!!! I am so happy and excited for her. I love and miss her so much!!! So we had mission tour on Wednesday, and Elder Kopischke was there!! It was six hours of goodness and lots of feeling the spirit and getting answers. He came in without an agenda, and he just asked us what we wanted to talk about. SOLID. He invited us all to write down a question at the beginning of our time together, and then to find the answer by the end through listening to the spirit. At the end he asked everyone to raise their hand if they got an answer, and everybody raised their hand. The Holy Ghost is real! He talks to each of us, and gives us what we are seeking for. So I saw all my Braunschweig friends, Elder Chadez, Brimhall, Carpenter, and then Sister Harris. Oh and Elder Meeks! SUCH FUN. Ruth had given sis Harris a present for me, so sweet!! It was a watch!! I had a letter for sis Harris to give to Ruth. The area is super humid, Lots of rain and clouds. But really pretty of course. Sunday eating appointments always mean the good German food. Yesterday I ate like a queen at a members house. rotkohl, potatoes, goulash, green beans, noodles, juice. and ice cream to top it all off. SO DELISH. Otherwise I eat a lot of cheese, yummy German bread, and nutella and gummy bears. Livin the life. German food is truly delicious. My companion and I are staying together, which I am stoked about!!! sister Murdock is done training now!!! We are ready to move forward and DO WORK this next transfer. jetzt geht's los, lemme tell ya!! 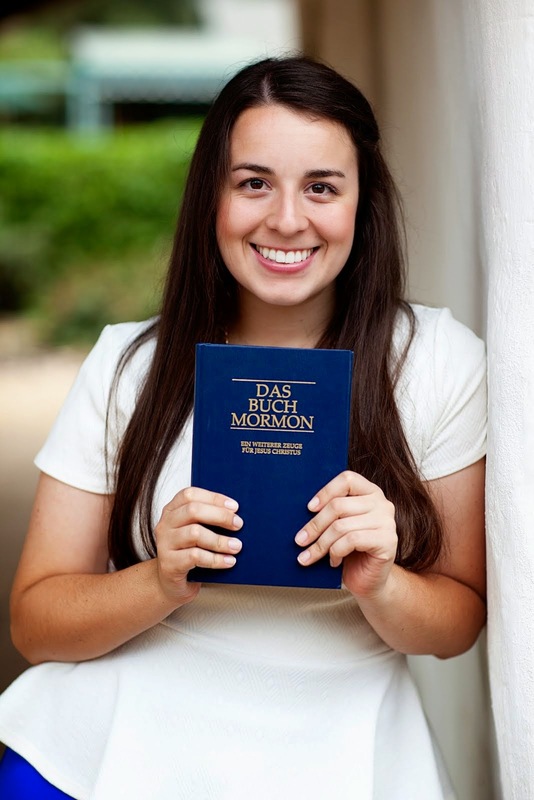 Best thing that happened, talking to an investigator, Catherine, about baptism and the Book of Mormon. She reads in the Book of Mormon every day, and on Sunday she was telling me how much she relies on it, and its where she gets her answers from. She speaks English, lived in the US for almost 25 years. As she was talking haha i just gave her a hug. She is so precious and so tender!!! She has a desire to be baptized and join the church, there are things she has to learn still and stop doing, like coffee, but she is progressing and we are movin' along!!!! Most challenging...being tired with the weather and waking up when it is so darn dark outside!!! But alas it's all worth it. HAPPY BIRTHDAY TO MONTY AND HAPPY ANNIVERSARY TO YOU MOMMA AND POPS. Love you allsosoooooososososososo much. Miss you tons, but I know I am where I am supposed to be. I am really having the time of my life here in Germany. BELIVE ME. Doctrine and Covenants 18:10 is like my life. It has changed my life. fur realz. Stay real my loved ones!!! Madison's 6 week calendar cover.